You worked hard to create a good contract with someone. What you don't want is to find out that the contract is unenforceable––that is, the contract is no good and must be torn up. An unenforceable contract is the same thing as an invalid or void contract––it can't be taken to court to settle any disputes. That's the problem with an unenforceable contract; you don't know until you try to take the contract to a court that it can't be enforced. By then it is often too late to correct the issue. So, before you sign on the dotted line, make sure the contract you are signing is enforceable. Why would a court throw out a contract? Here are some things to pay attention to when you create a contract. Capacity is a legal term meaning mental ability to understand and be accountable for making a contract. If you make a contract with someone who lacks capacity, the individual can get out of the contract without penalty. For example, someone who is under the influence of alcohol has a lesser ability to understand what they are agreeing to and may make decisions that are not in their best interest. If you sign a contract with someone who is drunk, and they later want to disavow it, you may be left high and dry. Minors. A minor is someone under the legal age of consent in a state. Incompetent. Someone who is incompetent has a low IQ or is mentally disabled or has diminished capacity due to conditions like Alzheimer's disease or dementia. Under the Influence. This category is for people who might usually be competent but who are under the influence of drugs or alcohol (including certain prescription drugs) when signing the contract. It's your responsibility to make sure that the person has the capacity to sign the contract. That means checking the ID of a young person or not signing a contract with someone who appears to be drunk or on drugs. The concept of a good contract means that both individuals are making the agreement of their own free will and that no one has been forced to sign. A contract made under duress can't be upheld in court. For example, a person can't be forced to sign a contract with threats or violence. Undue influence is similar to duress but more subtle. It usually involves a difference in power or influence in a relationship in which the parties are unequal. For example, a boss may have undue influence over an employee and force the signing of a contract that benefits the boss. You can see that this might be difficult to prove. Fraud is an intentional act that is a misrepresentation of the truth. Fraud can be either positive (telling a lie) or negative (not telling the truth or the whole truth). If it can be proven that one of the parties to a contract commits fraud, the contract can be unenforceable. An illegal contract is one that involves acts that are against the law or public policy (laws or regulations). For example, a contract to buy and sell illegal drugs is unenforceable, as is a contract the puts someone in a position of breaking a law. In general, a contract doesn't have to be in writing, but some types of contracts must be in writing to be enforceable. This requirement is different for each state, but some common types of contracts that must be in writing are prenuptial agreements, contracts for the sale or transfer of land, and contracts that can't be completed within one year. State laws vary; check the statute of frauds in your state or contact an attorney to see the laws in your state. 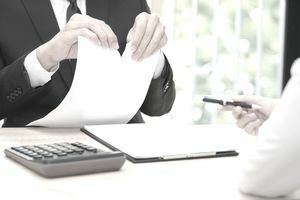 Do Mistakes Make a Contract Unenforceable? There are two kinds of mistakes in a contract––unilateral (made by only one party) and mutual mistakes (made by both parties). A unilateral mistake, like a mistake in the value of an item, might result in an unfair advantage to the other party. A mutual mistake, like the parties both making a mistake in the identity of an item, might make the contract void. Mistakes in a contract usually are considered on a case-by-case basis, and they have to do with whether the mistake is material (significant) and whether the mistake results in undue influence. It's difficult to make a definitive statement about mistakes; they have to be disputed and taken to court to find out if they make the contract unenforceable. Should I Get an Attorney to Write the Contract? Many unenforceable contracts are created by people who aren't attorneys. But attorneys don't always know that the contract they are writing is unenforceable. For example, unless the two parties are sitting in front of an attorney, they might not realize that one person is a minor or that the statement of one of the parties has made fraudulent statements. It's always best to have an attorney involved in making a contract, to avoid more obvious mistakes and to make sure the language of the contract is clear and complete.